Argentine farm consultancy Agripac cut its forecast for soybeans to 47 million tonnes and its corn crop estimate by 12% to 37 million tonnes. Funds have sharply reversed their market positioning on the back of worsening drought conditions in Argentina. 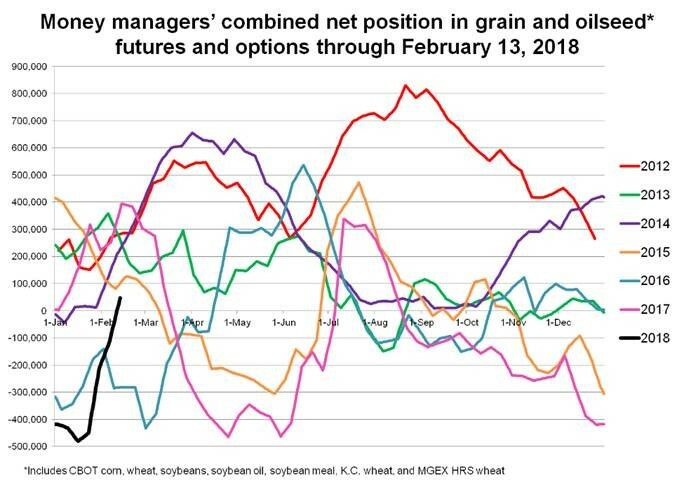 According to data from the U.S. Commodity Futures Trading Commission, hedge funds and other money managers switched to a net long position in CBOT soybean futures and options and nearly eliminated bearish bets in CBOT corn in the week ended Feb. 13; see combined chart for US futures with current year in black.